When attempting to keep passwords in memory, most people will either use insecure passwords or overuse the "Forgot password" feature. Choosing a strong master password is essential to protect your data. Common passwords and dictionary words offer little protection. 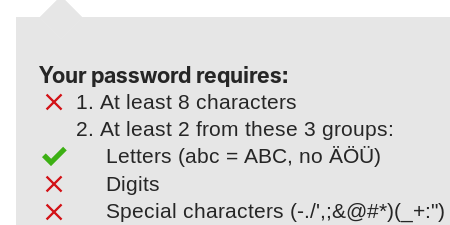 Generated passwords aren't saved to disk but rather calculated whenever they are needed. What are the implications in practice? What if your PfP data gets corrupted or you simply don't have access to your device? No reason to reset your passwords. By default, PfP will log you out after 10 minutes of inactivity. If you leave your device unattended, your passwords won't be exposed to unauthorized access. PfP can prevent many attacks on your credentials and limit the damage of others.